My main development work happens on a Mac using Mac OS because I develop apps. And frankly, I try to make a challenge out of it to not leave Mac OS for other development work as well. This works very well because of tools like Visual Studio for Mac and Visual Studio Code. There is one tool that I was missing though, the SQL Server Management Studio. 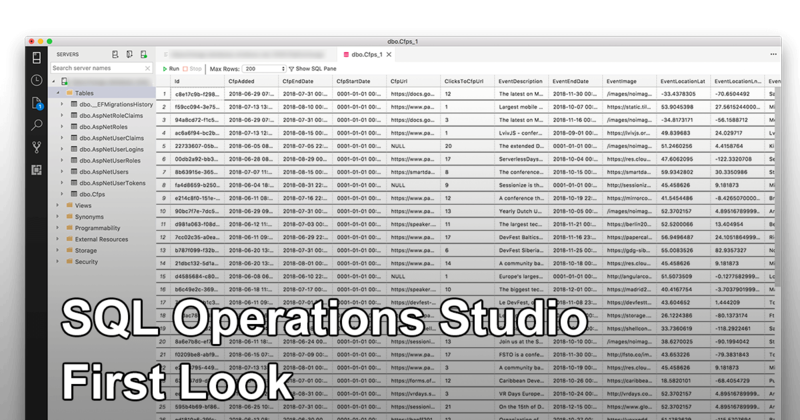 I have recently learned there is an alternative to this which works cross-platform for Windows, Linux and Mac OS and it’s called SQL Operations Studio. In this blog, I will give you a quick glance. When I just started SQL Operations Studio, it notified me that it will not receive future updates. Instead, you should download Azure Data Studio. From what I can see, at this point, the application is the same but Azure Data Studio will evolve from this point on. 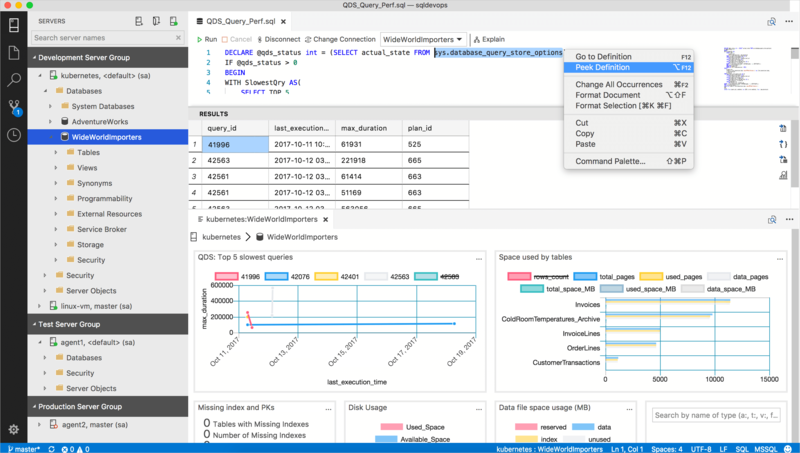 The SQL Operations Studio is an open-source tool which you can get from GitHub: https://github.com/Microsoft/sqlopsstudio. You can get it for Windows, Mac and Linux at this time. Installation on Mac is pretty simple, just download the archive and place the resulting executable in your Applications folder. After that, you can simply run it. I imagine on other platforms it will be just as easy. 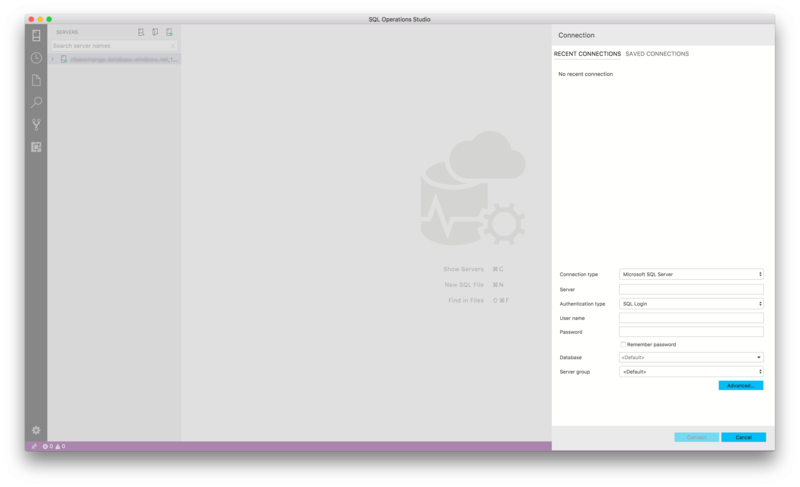 What really stood out when first starting SQL Operations Studio is that it bears great resemblance with how Visual Studio Code looks. Which is, in my opinion, good looking. Adding your first connection is pretty easy. Although you can only choose a Microsoft SQL Server as a connection type, this can be used for Azure databases as well. Just paste in the server name, username and password and hit Connect. I was instantly able to browse through my Azure database and even edit records from it. Something that is also available from within the portal in preview. But still, a desktop tool to do this is so much easier and faster. What can it do today? I, myself, didn’t really need that much. Just connecting to the database and being able to query through my data and editing it was fine for me. Also, it seems that is what the focus is on right now. You are able to connect to a server, or multiple servers for that matter and browse through the tables and rows. From the grid, you are able to edit the data directly and there is also an SQL pane that you can pop open to write your own queries. You can also access other things from the database like views, stored procedures, users, etc. but you can’t manage those with anything other than queries. Another very useful thing you can already do is add Insight widgets. As shown in the screenshot underneath, you can easily access information on the top 5 slowest queries or the disk space used by certain tables. The data comes from queries that you write yourself so you can come up with any widget that you can think of. What is also great is that IntelliSense is available when writing your queries. Also, just like VS Code, there is support for extensions. There is a handful of extensions available right now, but this will probably expand over time. Again, for me, the most important functionality is in there. But if you’re used to the SQL Server Management Studio (SSMS) then you might miss a few things. The thing that stands out most is that GUIs are missing. In SSMS you have GUIs to manage users, generate a database scheme or add a column to a table. All that is not in SQL Operations Studio right now. Also, importing or exporting data might be something that can be very useful in the future. For sure, I will be keeping an eye out for this tool and I think you should too! Let me know what you think about it. That might be right. The product is still in preview and first focussing on the basics. I have been trying to find a User Voice or similar where you can request new features, but I didn’t find anything yet. Your best bet would probably be to open an issue on the GitHub repo for now.